Barcelona Photoblog: Modernist Building, Rambla Catalunya 61 next to Arago St.
Modernist Building, Rambla Catalunya 61 next to Arago St. Newly restored modernist building on the corner of Rambla Catalunya and Carrer Arago. Located exactly at Rambla Catalunya 61 this apartment building with offices to rent (I have seen one with 150 square meters advertised for 2500 EUR/month!) immediately grabs our attention for that interesting combination of undulated balconies, exuberant ironwork and glass covered galleries. 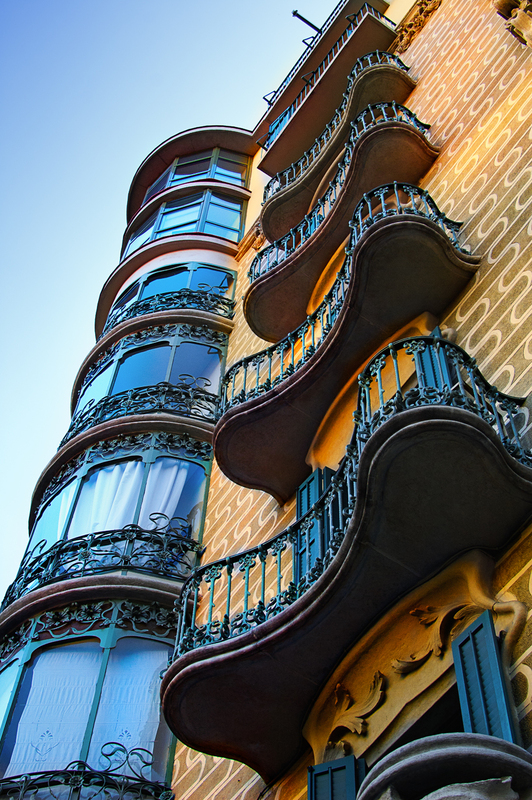 I think you should examine this Eixample quarter Art Nouveau gem closer in Google street view: Modernist House Rambla Catalunya 61. It is a beautiful building, but 2500 euro to live there...no I don't think so. Well, it was the price for an office. Dwellers other than companies certainly pay a little less. Very decorative. I like the curves too. I have passed that building many times but have never really 'seen' it. It is a lovely building and your photograph really shows the detail to great effect. There are so many amazing buildings in Barcelona and I love to see how you bring them to our attention and take a moment to explore the detail and architecture. i love spain over paris anytime. Can I move in next week? Beautiful in every way. The cast iron, the brick work, the carvings, the overall effect. Great discovery. Those are such fantastic balconies and windows! Wow - must be very expensive real estate!